An international research team led by Shin Toriumi (Specially Appointed Assistant Professor at the National Astronomical Observatory of Japan) analyzed observations of sunspots as they formed taken by Hinode, the Solar Dynamics Observatory (SDO) and the Interface Region Imaging Spectrograph (IRIS) satellites. The team modeled the observations using state-of-the-art numerical simulations performed on the Pleiades supercomputer at the NASA Ames Research Center. The study reveals how during the course of sunspot formation the territorial struggles between magnetic bundles emerging onto the Sun’s surface drive the formation of so-called ‘light bridges’ and the generation of plasma jets and explosions. This study reveals, for the first time, the intimate relationship between the magnetism hidden in the solar interior, sunspot formation at the surface, and the dynamism of the Sun’s atmosphere. The peer-reviewed results will appear in The Astrophysical Journal. 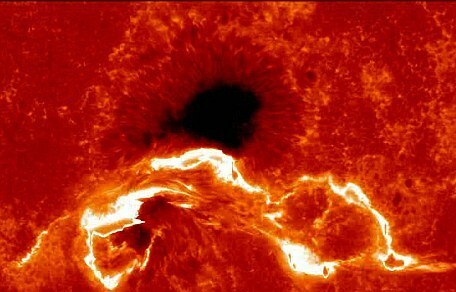 Sunspots are planet-sized conglomerates of bundles of intense magnetic field lines on the surface of the Sun. They are known to cause explosions (solar flares) which can directly impact our technological infrastructure. What astrophysical mechanisms are responsible for the formation of sunspots and how do they drive explosive events are important questions in our quest to understand the Sun’s activity and its magnetic effect on Earth. This entry was posted in Solar, Space/Galaxy and tagged Earth, hinode, Interface Region Imaging Spectrograph, IRIS, magnetic, national astronomical observatory of japan, plasma jets, SDO, Solar Dynamics Observatory, sun, sunspots. Bookmark the permalink.